It has been announced that Graham Pearson has been posthumously named as the winner of the 2018 Cherriman Award. This is presented annually by the Home countries Masters Swimming Management Group to ‘the person or organisation who or which has done the most to promote and foster the cause of Masters swimming in Great Britain’. Muriel Moffet has decided to retire from officiating at Cumbria ASA competitions and 'called it a day' at the 2018 Cumbria Winter Meet. Muriel has been a British Swimming referee since the early 2000's. 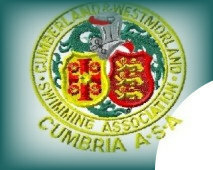 She was President of Cumbria ASA in 2011-2012. Although retiring from an officiating role Muriel will still be very much involved at Carlisle Aquatics, coaching, mentoring new officials and supporting her home club. Thank you for many years of support and commitment. The Eden Swim project was completed by brothers Jack, Calum and Robbie Hudson in August 2015 when they swam 90 miles down down the River Eden to raise funds in aid of the Swimming Trust. The swim took 9 days with the brothers swimming up to 12 miles a day. They clambered down waterfalls, over weirs and rocks to become the first people ever to swim the length of the river. The swim was in aid of the Swimming Trust who have been in discussion with the brothers and have decided that the best use for this income would be to focus it on improving swimming teaching in Cumbria. All the money will be put back into swimming through setting up a bursary scheme in Cumbria to help more swimming teachers gain their level 2 qualification. The bursary scheme has been funded by £3000 from the 'Swim the Eden' project , £1000 from the Swimming Trust and £1000 from Cumbria ASA, which was launched on October 1st 2016. Further contributions may be made in the future. These funds will be 'ring fenced' by Cumbria ASA and will not be available for any purposes other than to assist the training of level 2 and above teachers/coaches. Details of the bursary scheme are available from Martin Tickner. The ASA Sport Governing Board have agreed the following in relation to hearing impaired swimmers. Multi-classification events are only open to swimmers with an impairment which is included in the Paralympics i.e. classifications S1 to S14 inclusive. Classification S15 (Hearing Impairment) is not included in Paralympic Events. Hearing impaired swimmers (S15) may compete in events if the meet conditions allow for S15 events. Medals are to be awarded within this specific classification as these swimmers are not eligible to compete for medals in multi-classification events. S15 does not have to be swum separately as the results can be extracted from the overall event. Hearing impaired swimmers may compete in any able bodied event. An appropriate starting signal should be agreed between the swimmer and the referee.